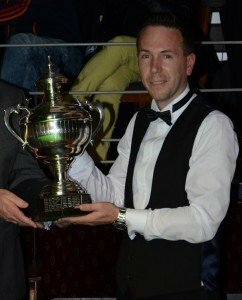 WBL President Roxton Chapman defeated the current world no.1 ranked player Dave Causier in the final of the LITEtask UK Open at the Northern Snooker Centre in Leeds at the weekend. In what can only be described as a remarkable outcome to this event the 1999 UK Professional champion managed to outwit some of the leading players in the game despite having been in almost total retirement from billiards for something like 5 years. For all results from the tournament see here. For a full report and pictures click here. The UK Championship has a history dating back to 1934 when Joe Davis first won the title. The event was resurrected by the late Jim Williamson in 1979 after a gap of 28 years, and following another hiatus since the early 2000’s it is again back on the billiards calendar, this time as an open event. 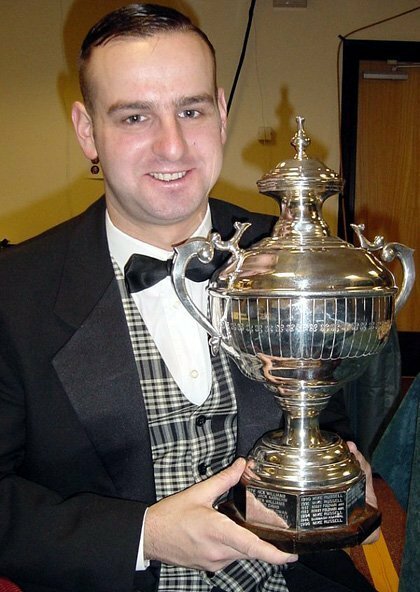 We have recently restored the original WPBSA trophy (last won by David Causier) and following the overwhelming success of the revived event this year we plan to make this prestigious tournament a permanent fixture on the calendar. The Plate Flyer was won by Nathan Mann, who defeated Trevor Smith in the final. For all Plate results see here. with the Home Internationals Billiards & Snooker Federation providing the officials. Click here for the pre tournament press release (World Snooker). Click here to see the prize money breakdown. This was a level 4 World ranking tournament with x1.5 ranking points and £3630 total prize money.